In an age of scepticism, the immense popularity of psychological illusionist Derren Brown may appear to run counter to the Zeitgeist. Yet it’s actually his extraordinary skill at tuning into the beliefs and doubts of a spiritually confused nation that has brought him to his current position as one of Britain’s most acclaimed and revered entertainers. Svengali, Derren’s fifth live stage show taken on national tour, is playing to packed houses for a full week (5th-10th March) in the large auditorium at Salford’s Lowry Theatre. And it’s returning, by popular demand, for two further shows in May. Despite the recent resurgence of interest in more mainstream magic, no conjuror would be able to fill theatres up and down the country night after night, month after month, the way Derren does. What is it about mentalism that resonates with the public psyche? Although Paul Daniels is a household name and although the new generation of magicians, such as Dynamo, are changing the image of conjuring, making magic ‘cool’, there persists a widespread misconception that magic is for children. Perhaps mentalism is more readily accepted as adult entertainment. Or maybe it’s more subtle than that. I love a good conjuring show (Hallowe’en 2009 at Simon Drake’s House of Magic remains one of the highlights of my life) and, secretly, I prefer it to mentalism. For me, the joy of watching objects and people vanish, change shape, dissolve, appear, levitate in front of my eyes is that it connects me with my inner child, reminds me of a time when I used to believe nothing was impossible. But it could be that I’m out of step with the trend here, which wouldn’t be the first time of course. Or it could be that today’s audiences consider themselves too sophisticated for child wonder and instead want more cerebral, adult mystery. When someone flies, or removes the hand of a volunteer so that we can see it running around by itself, as adults we know there is no other explanation other than that the magician has deceived us. We may choose to suspend our disbelief for the duration of the show, but the line between reality and ‘magic’ is very clear. With mentalism there is always that slight blurring of the edges. I believe in a degree of telepathy between people who have a close bond, I believe in the transformative power of the mind, I believe there are phenomena humans have yet to understand. I do not believe a stranger on a stage can divine any secret from my past by looking at me, still less that he can hypnotise me into behaving unnaturally. And yet, and yet, there’s always that grey area of doubt; the boundaries are not so clearcut. Derren always makes a point of emphasising he has no supernatural powers. The explanations he offers for his apparently impossible knowledge of the past or the future, or for seemingly taking control of someone’s mind, revolve around statistical analysis, neurolinguistic programming and the judicious deployment of other such skills. These explanations have a spurious plausibility to them that give Derren a latitude not available to mainstream magicians. They also prevent him becoming the target of debunkers: he has never claimed to be psychic, so what is the point of setting out to prove he’s not? 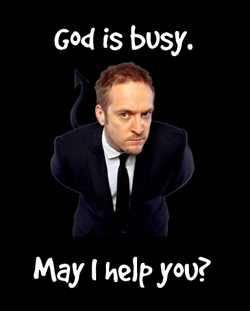 Without doubt, Derren Brown is a genius. The relaxed authority with which he commands the auditorium is a masterclass in showmanship and people management. The feats he pulls off are astonishing. He has carved a niche for himself that fits his personality and his exceptional talents perfectly. And the public, it seems, can’t get enough of him. Compared to switching on the television, buying a ticket and going out to a show is a significant effort, yet many people attend Derren’s productions who never otherwise set foot in a theatre. So then again, perhaps it isn’t mentalism per se that draws people into these shows; perhaps it is the man himself. Whatever the reason, tickets to see Derren Brown live sell like hot cakes at a foodies’ convention and I booked mine nearly a year in advance. Unfortunately, I can’t reveal any specifics of what goes on during the show, because Derren swore us all to secrecy. What I can tell you is, it’s a mixture of mind-reading, hypnotism and predicting (or should that be controlling?) the decisions of audience members, with a dash of the occult and a pinch of hunt-the-slipper. This can make for quite a heady cocktail and apparently some punters have been known to faint or vomit in reaction to taking part in one of Derren’s ‘experiments’. The eponymous Svengali turns out to be an automaton, with a suitably mystical history and, of course, magical powers. This doll provides one of the rare spine-tingling moments in an otherwise, this time, slightly unfulfilling evening. After all the singing of Derren’s praises I’ve done above, it may sound like a jarring note but this is not Mr Brown’s best show. To me, it was an echo of the Enigma tour, with which he entranced his public two years ago: the same types of effects but with less impact. However, that’s not to say it isn’t a very enjoyable few hours’ entertainment. 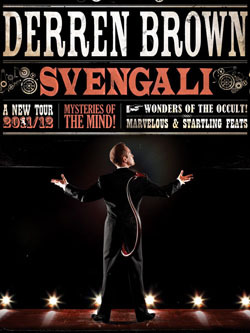 Tickets for the remaining performances of Svengali have almost certainly already gone but, next time Derren Brown brings his remarkable blend of psychology and illusion to town, I recommend you experience it. To see if there are any tickets left for Svengali, see Tour Dates on Derren’s website.